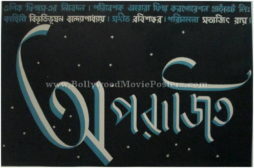 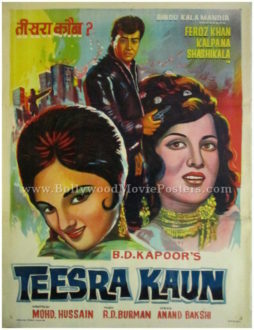 Old Bollywood poster of the Hindi film Teesra Kaun (1965) for sale. 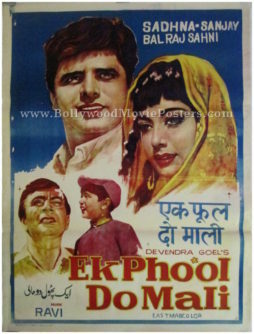 Featured here for sale is a vintage Bollywood poster of the 1965 Hindi film that starred Feroz Khan, Kalpana and Shashikala in lead roles. 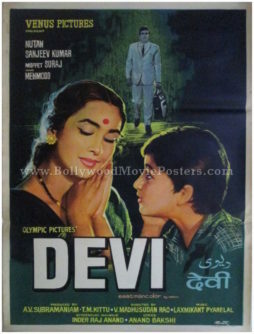 Printed and circulated a few years after the original release of the film (late 1960s), this old Hindi movie poster was originally designed for publicity of the film but never ended up being used. 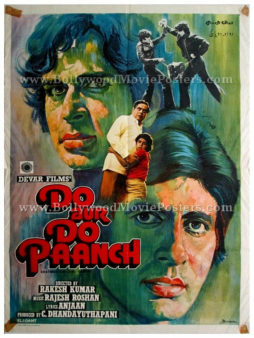 This old Bollywood poster features quirky hand painted artwork and was designed originally on canvas in Delhi by poster painter O.P. 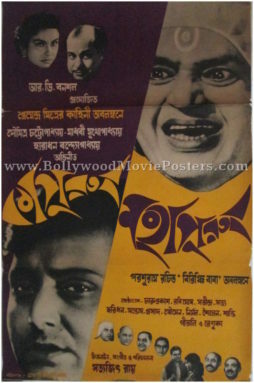 Bangali. 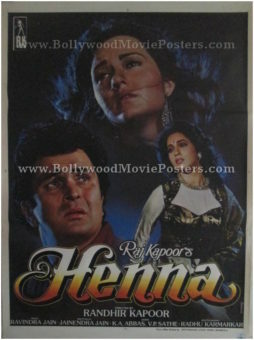 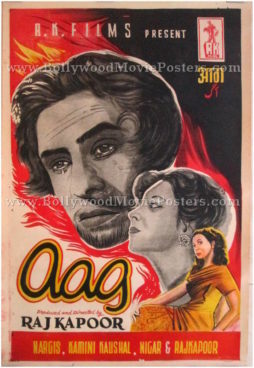 Large hand painted faces of the two leading ladies from the film are seen on either side of this vintage Bollywood poster. 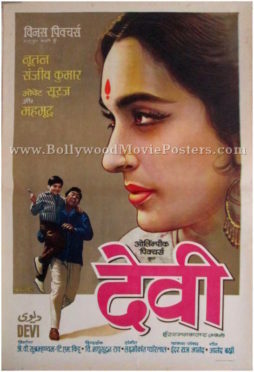 The artwork style is very typical to hand drawn movie posters designed in Delhi. 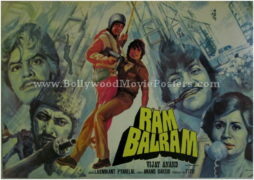 The lead protagonist is seen holding a pistol at the center. 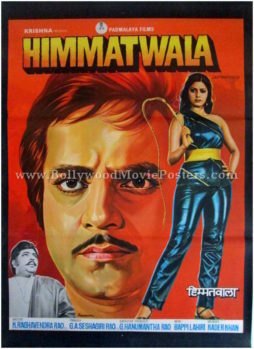 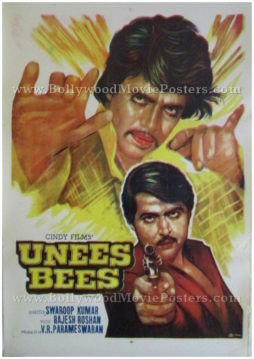 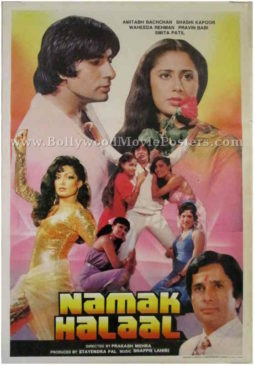 This old Bollywood poster has an action scene sketched as a suggestion in the background, giving away the genre of the film. 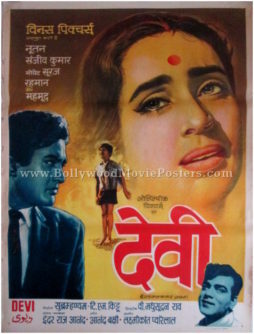 This is an actual surviving vintage Bollywood poster of the 1963 Hindi film that featured Sunil Dutt and Leela Naidu in lead roles. 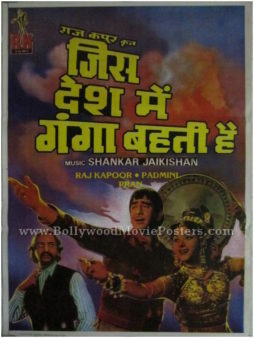 Yeh Rastey Hain Pyaar Ke was Sunil Dutt’s debut production, making this old Bollywood poster highly collectible! 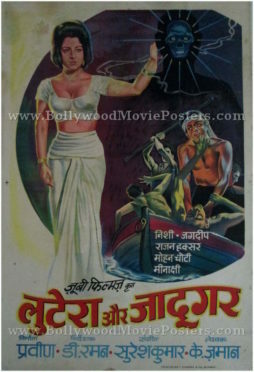 Printed and circulated during the first release run of the film (early 1960s), this old Bollywood poster was originally designed for publicity of the film but never ended up being used. 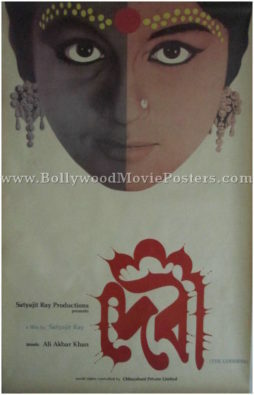 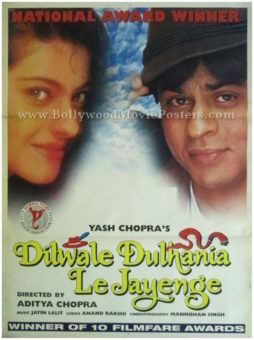 This old Bollywood poster was originally hand painted on canvas by a leading poster design studio in Bombay. 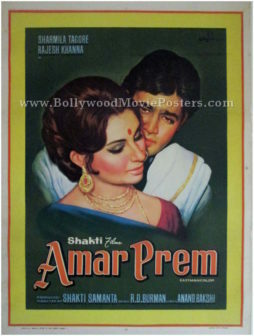 A stunning painting of the lead couple locked in a passionate embrace is seen set against a red background in this poster. 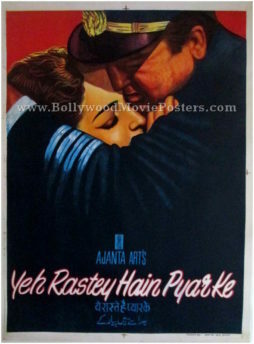 The plot of Yeh Rastey Hain Pyaar Ke was based on the sensational K.J. 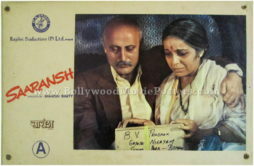 Nanavati adultery and murder case. 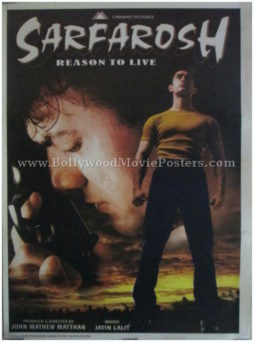 The shocking twists and turns of the real life story and court case that ensued inspired three films on the subject. 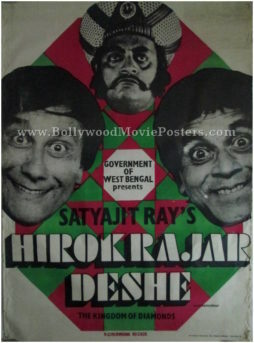 Yeh Rastey Hain Pyaar Ke was the first film to turn the story from real to reel life. 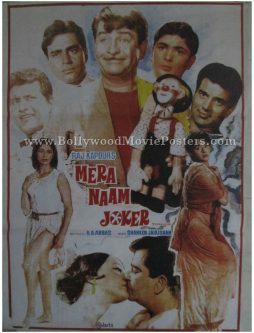 The other two films were Achanak (1973) and the Akshay Kumar starrer, Rustom (2016). 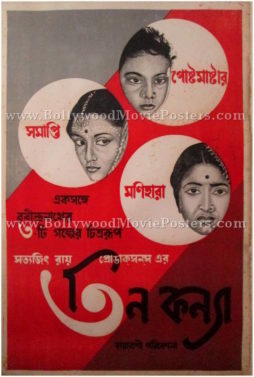 Old Bengali movie poster of one of the finest films ever made in Bengali cinema, Kabuliwala (1957) for sale. 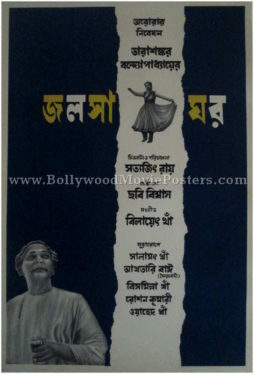 Written and directed by master filmmaker Tapan Sinha, Kabuliwala is a 1957 Bengali film based on a popular story penned by legendary Bengali writer Rabindranath Tagore. 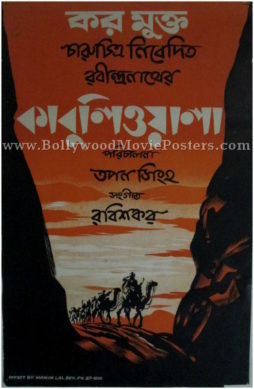 Kabuliwala won the 1956 National Film Award for Best Feature Film and the Silver Bear Extraordinary Prize of the Jury at the 7th Berlin International Film Festival, making this old Bengali movie poster highly collectible! 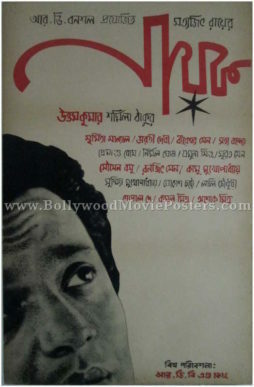 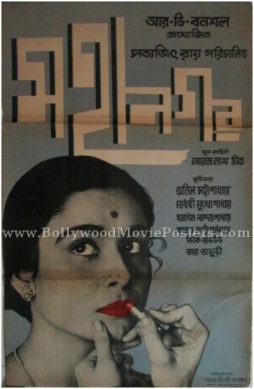 Printed and circulated during the debut release of the film (somewhere in the late 1950s), this is one of the rarest Tapan Sinha movie posters for sale that one can buy.